That's why in love nothing maters if its true. 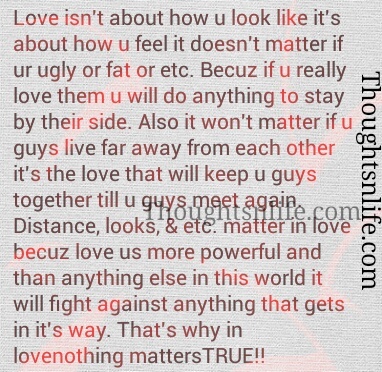 Love isn't about how you look its, about how you feel it doesn't matter if you are ugly or fat or etc. Because if you really love hem you will do anything to stay by their side . Also it won't matter if you guys live far away from each other . Its the love that will keep you guys together till you guys meet again. Distance , looks, & etc doesn't matter in love because love is more powerful than anything else in this world it will fight against anything that gets in it's way. That's why in love nothing maters if its true.